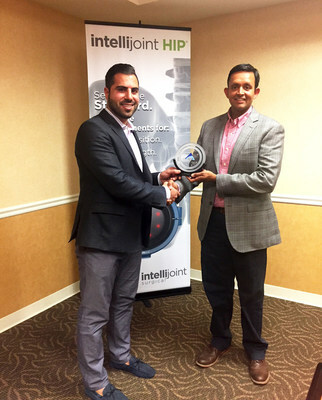 MORTON GROVE, IL, July 16, 2018 /PRNewswire/ – Orthopedic surgeon, Ritesh Shah, MD, was honored with the IJS Innovation Trailblazer Award of Excellence acknowledging early adoption of intellijoint HIP® into his practice at Illinois Bone & Joint Institute and in an Ambulatory Surgery Center (ASC) setting at Illinois Sports Medicine & Orthopedic Surgery Center (ISMOSC) in Morton Grove. A total hip replacement is typically an effective surgery that can reduce hip pain and restore mobility. The risks of this procedure can include leg length discrepancy, dislocation, joint instability, reduced muscle strength, reduced hip range of motion, and long-term pain. intellijoint HIP addresses these risks by providing accurate, intraoperative measurements for cup position, leg length, and offset to assist the surgeon in placing implants in a location that best matches the patient’s native anatomy. Intellijoint Surgical® develops and commercializes surgical navigation solutions. Intellijoint’s flagship product, intellijoint HIP® provides surgeons with real-time, intraoperative measurements to ensure accurate positioning of orthopedic implants during Total Hip Arthroplasty. Intellijoint is committed to improving patients’ lives by providing every surgeon with effective, easy-to-use technology.